Angel on My Shoulder is, in short, an excellent film, with excellent acting. 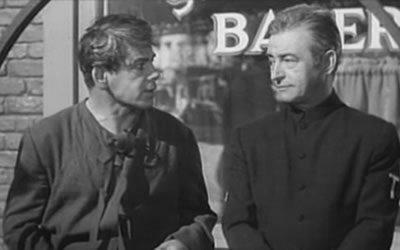 Paul Muni is one of those actors who is totally submerged in his role, and does an excellent job. Here, he’s a gangster who’s been murdered by his partner – and sent to Hell. And he’s surprised by an offer from the Devil himself. The Devil, aka. 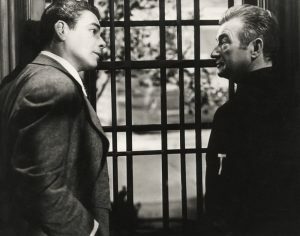 Nick, is played by Claude Rains, another great actor. Many people have portrayed the Devil on film, but nobody has done it better than here. Claude Rains. He portrays the Devil as a sly, manipulative, smooth person … who is only trying to help the gangster. And, is fascinating to watch. The Devil offers the gangster a chance to return to life, to take over the body of a crusading judge who’s collapsed. An honest judge, who can’t be bribed, who works to keep children from turning the wrong way. A judge running for Governor, which doesn’t suit Nick’s plans at all. And so he plans to have the gangster ruin his reputation. 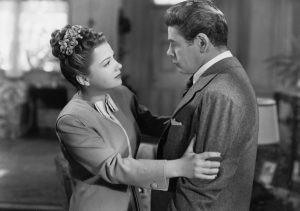 Anne Baxter as the Judge’s fiancee with Paul Muni in his body. She’s interested in the Judge for power … for the right reasons. He can help the world, and she wants to help him do it. The gangster, now in the Judge’s body, pursues his goal with evil intent (though often at cross purposes with the Devil). But everything he does to ruin Judge Parker’s reputation somehow results in making Parker look better. Along the way, the gangster falls in love with Barbara Foster (Anne Baxter), the judge’s fiancée, causing him to question his whole outlook on life and eventually rebel against Nick. Especially after he and Barbara run off to get married, and he has an interesting discussion with the minister. Nick presents him the opportunity to shoot his own murderer – with the very gun he was murdered with. Instead the gangster confronts the man with the truth. Shocked and frightened, Williams backs away and falls out an open window to his death. At the conclusion, Nick has had enough. The Judge’s election is virtually ensured, and Nick is going to “lose face” in the underworld. Nick takes the gangster back to Hell, leaving the Judge and Barbara to have the ideal life that the gangster realizes that he could have had. And, in a final turn, he blackmails Nick into making him a trustee! Nick: When I get you down below I’m going to take special pains with you. I’m going to introduce you to agonies undreamed of. Eddie Kagle: I don’t think you’ll be so tough. Nick: This is sheer unblushing blackmail! Eddie Kagle: You oughta know, brother. You oughta know. Barbara Foster (Anne Baxter, The Fighting Sullivans). The Judge’s fiancee, who is glad to see that he’s recovered from his “fainting”. She does legitimately care for the Judge … but to a degree, because of the good that he will do. She notices the great change in him, but initially chalks it up to his recovery. And begins falling in love with his altered personality. Nick (Claude Rains, Casablanca). The ruler of Hell, who’s manipulative, deceitful, … and smooth. He wants to use Eddie to undercut the Judge’s career — because he fears him. But Eddie unwittingly undercuts him. A truly great performance. Albert (George Cleveland). The judge’s butler, who has trouble adapting to the judge’s new personality. A comedic character, well played. Minister (Erskine Sanford, Citizen Kane). The minister that Eddie and Barbara want to marry them. He’s somewhat of an odd character, as he’s writing his sermon and doesn’t want to be distracted. But he makes a huge difference to Eddie in the few minutes that they’re together. Smiley Williams (Hardie Albright). Smiley is Eddie’s traitorous partner. His childhood friend, who picks him up when he’s released from prison. His criminal partner, who’s moving into the “big time”. He thinks of Eddie as the muscle, and himself as the brains. And he kills Eddie without hesitation or pity, so he can’t be betrayed. His death at the end of the movie is … interesting. Angel on my Shoulder is the darkly comic tale of a murdered gangster who arrives in Hell, only to be sent back to Earth to make up for his sins. Starring Oscar winner Paul Muni, the film also features Claude Rains, Anne Baxter, and Onslow Stevens. Directed by Archie Mayo ( The Petrified Forrest, A Night in Casablanca), from an original story by Harry Segall, this thought-provoking tale packs a moral punch!